* Soft Tissue Deniers / Science Deniers: Real Science Radio hosts Bob Enyart and Fred Williams list the soft tissue deniers, aka the science deniers, among leading evolutionists, media outlets, and anti-creation websites. * RSR's List of Soft Tissue Deniers (and Doubters): This brief representative list documents the evolutionist science deniers and doubters for this specific topic. We'll occasionally update it and if any of these popular evolutionists sends a retraction or clarification to RSR, we'll note it here. The first such find [?] was announced back in 2005 when biologist Mary Schweitzer and colleagues announced that they had found the remnants of blood vessels and other soft tissues in the femur of a Tyrannosaurus. ...over the following decade, Schweitzer and others have built a convincing case [yes, completely] that dinosaur bones are not wholly stone, but to varying degrees retain some of the original tissues that grew when the animal was alive. - University of Houston Biochemistry Prof. Dan Graur: This author of Molecular and Genome Evolution, aka the blogger Judge Starling, wrote on Feb. 8, 2017, "Proteins from 80 and 195-million-year-old dinosaurs 'recovered'", regarding papers in the highly respected journals Nature Communications and the Journal of Proteome Research. As with countless evolutionists, Graur science-denying rejection of the greatest discovery in the history of paleontology is based on his evolutionary timeframe. He wrote, the "only conclusion that can be drawn from the publication of these two articles is that the gullible have a very short memory." Graur dismissed this recent research (and by extension, the more than 60 peer-reviewed discoveries of biofossils), regardless of the cutting edge technology used, by listing six "discredited" papers from 1990, 1993 to 1995, and 2000, none of which RSR has ever listed on our comprehensive and authoritative online spreadsheet, List of Original Biomaterial Fossils (maintained)", dismissing the latest research by listing twelve papers and summing them up only by saying that "Jurassic Park" is "fiction". - Anonymous "Researchers": TheScientist, 2018, 32(3):34-41, as reported by Catherine Offord, "some researchers still doubt that proteins can resist degradation for tens of millions of years..." That is, they are still denying, after 98 papers as of April 2018, the extant endogenous biological material from fossils dated at, allegedly, between five million and 1.88 billion years old. - League of Reason in a high-profile debate, and in its Peanut Gallery comments from moderators and regular members (click and search for: soft), including as late as 2014 and March 2015. - Tony Reed: "How Creationism Taught Me Real Science" host Tony Reed in a video posted in 2015 and still on YouTube even without correction on-screen or in the video's Description, Reed says of Mary Schweitzer's discovery, "People believed that Schweitzer had found blood cells..." Of course, Mary, and other scientists, have found dinosaur blood. See especially in 2015, Nature Communications, Bertazzo, et al! - Sherry Konkus at stupiddinosaurlies.org copyrighted 2010 - 2013 (Konkus removed the page, even from archive.org, but RSR put it back online), mocks creationists for claiming "that Paleontologist Mary Schweitzer have [sic] found inside the fossil bone blood cells and hemoglobin... while ignoring the fact that Mary actually found none of it... But that's not all. In 2005... she thought she found soft tissue in the bone [but] Mary, in reality, actually found slime [a claim now falsified] — biofilm created by bacteria... Still, this doesn't stop the creationists from making slanderous, derogatory remarks..." Update: As of 2015, this site took down that page and now claims that iron can preserve endogenous material for hundreds of millions of years, even though iron cannot explain the varied circumstances in which soft tissue is found. 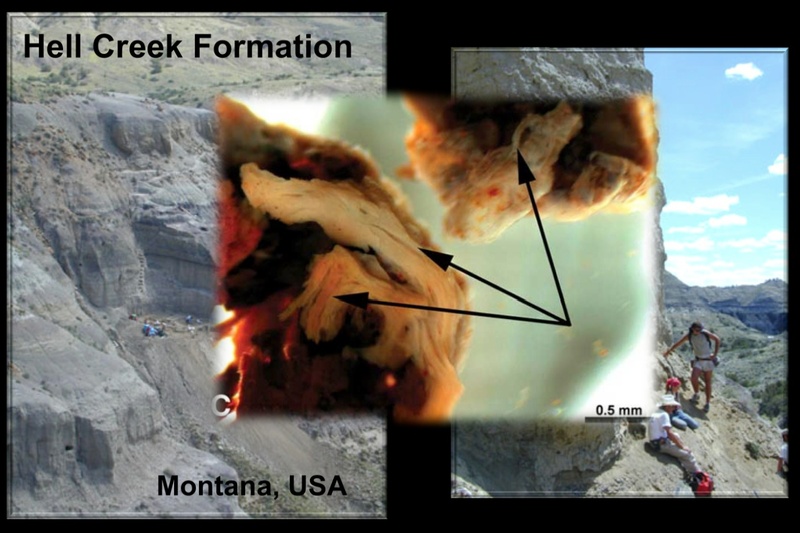 - Gary, S. Hurd, Ph.D. at noanswersingenesis.org.au, even as of June 2013, has not corrected or even put a disclaimer on his Dino-blood and the Young Earth article which harshly criticized creationists for their optimistic presentation of the early reports of dinosaur blood vessels and cells. 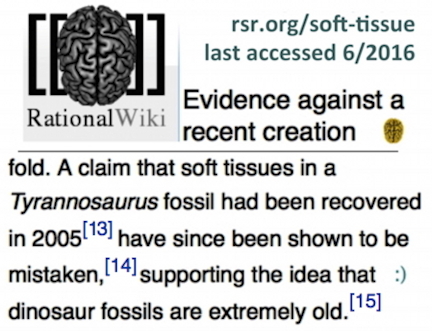 Ultimately, the creationist expectations on the existence of dinosaur soft tissue were vindicated, and the countless evolutionists who mocked both Schweitzer and the creationists (for their presumption that soft tissues would be confirmed) have yet to humbly congratulate the creationists for an expectation come true. - Nigel Deplege, commented at Discover Magazine's site against a challenge by Bob Enyart, posted Sept. 1, 2011. Published evolutionist Deplege wrote, "...soft dinosaur tissue has never been discovered or reported. What you perhaps refer to is the discovery of fossilised impression of soft tissue structures." If Nigel (or any of these evolutionists listed) contacts Real Science Radio admitting error, we will post his admission here. - Wikipedia List of Dino Soft Tissue: As of June 15, 2016, Wikipedia's List of dinosaur specimens with preserved soft tissue, presents only two finds, and neither of them suggest the existence of any nondecomposed, endogenous soft tissue. - Don: "The entire episode is an opportunity to watch creationist lies in the making - not one of them actually knows what they're talking about..."
- Jethom33545: "...creationists are ALL liars or grossly misinformed. I'm going with liars." - Space Wasp: "The quote you give is a false claim... they are not found as 'soft tissue' as creationist claims tend to imply." - Ladyren: "Soft tissue contains water. Water evaporates very quickly. The claim is false." 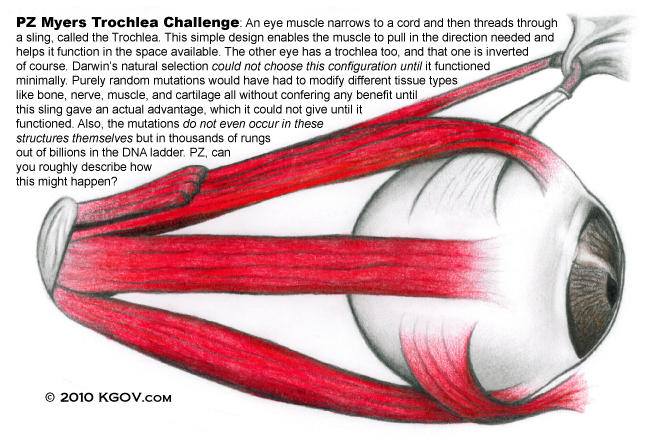 - PZ Myers and virtually all the evolutionists on his blog doubted or outright denied extant dinosaur soft tissue when the infamous evolutionist PZ Myers replied to our RSR Trochlea Challenge. To his credit, he said, "I don't know," which in itself does not prove that he is wrong nor that I am right, but it is pretty funny that the simplest of anatomy designs could stump one of the world's leading Darwinists. YEC's continued claim there was "soft" tissue found, represents a failure to even read the peer reviewed papers. No organic material was ever found. The material that was found was calcified, which became "soft" after a bath in acid. Learn to read! In summary, on what is the greatest paleontology discovery in history, PZ Myers and AronRa join those evolutionists who are science deniers and science doubters, all because they intuitively know that even simple changes in temperature gradually breakdown complex biological molecules which all of science uniformly maintained could not exist for even one million years. Now, they've got to deal with Harvard sequencing hardrosaur proteins, blood vessels from a T. rex, biological material from archaeopteryx, and a whole boatload of other related problems, including carbon 14, left-handed amino acids, and a world looking them square in the face and saying: "If you believe soft tissue can last for 65 million years, you'll believe just about anything, won't you?" So, for the short-term, it's a lot easier to be a soft tissue denier. But the cure is now here: DinosaurSoftTissue.com! RSR Listeners: Please feel free to email other soft tissue deniers to Bob@KGOV.com. And let us know if any of our Darwinist listeners over at TOL, such as Alate_One or Johnnie, are deniers. Thanks! Scientific Journals: Nature, Science, PNAS, PLoS One, Proceedings of the Royal Society, Bone, the Journal of Vertebrate Paleontology, and others below in our chronological catalog, "the web's most complete list of dinosaur soft tissue discoveries," as published in many leading journals, according to a co-author of one of those papers. Biological Material Found: As of April 2014, in fossils from dinosaur-layer and deeper strata, researchers have discovered flexible and transparent blood vessels, red blood cells, many various proteins including the microtubule building block tubulin, collagen, the cytoskeleton component actin, and hemoglobin, bone maintenance osteocyte cells, and powerful evidence for DNA. Dinosaur and Dinosaur-Layer Creatures: The dinosaurs and other Mesozoic creatures that have yielded their biological material are hadrosaur, titanosaur, ornithomimosaur [ostrich-like dinosaurs], mosasaur, triceratops, Lufengosaurs, T. rex, and Archaeopteryx. Today’s Resource: Get the fabulous Carl Werner DVD Living Fossils and his great prequel, Evolution: The Grand Experiment! And have you browsed through our Science Department in the KGOV Store? For the best of the best in creation books, debates, and videos, click on our Science Department or just call us at 1-800-8Enyart (836-9278). HOT OFF THE PRESSES! Another RSR Prediction Fulfilled! NOW, allegedly 530 million-year-old soft tissue: Tune into the above program for our excerpts from a Journal of Paleontology paper on the soft tissue in Precambrian "beard worm" fossils that we've added to our list of dinosaur soft tissue discoveries!